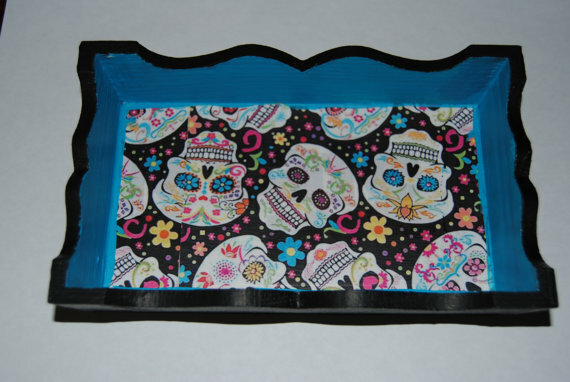 One such decoration placed on these alters are called Sugar Skulls. I have always been fascinated with the sugar skull image. Each are unique much like the soul itself. An image of a skull adorned with colorful flowers and hypnotic eyes instantly fascinated me. I picked up this miniature wood jewelry tray (unfinished ) at AC Moore. I hand painted the piece with acrylics and matched the primary color to the greenish-blue color on the print. (yellow, pink or black would work also) It looks great for Halloween or keep it out all year-long on your dresser. Great for holding various jewelry, rings or change. Cut print to size, apply Mod Podge and then the print. Carefully smooth out with your hands. Once dry seal with a few layers of Mod Podge allowing to dry between coats. 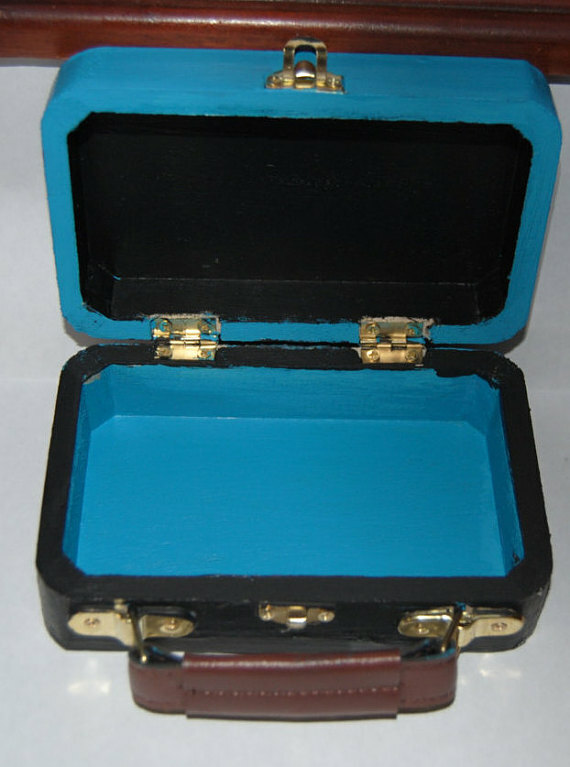 This adorable wooden mini suitcase also purchased unfinished at AC Moore follows the same decoupage process as above. I used the suitcase to trace the image on both sides of the piece to assure it was cut to proper size and shape. 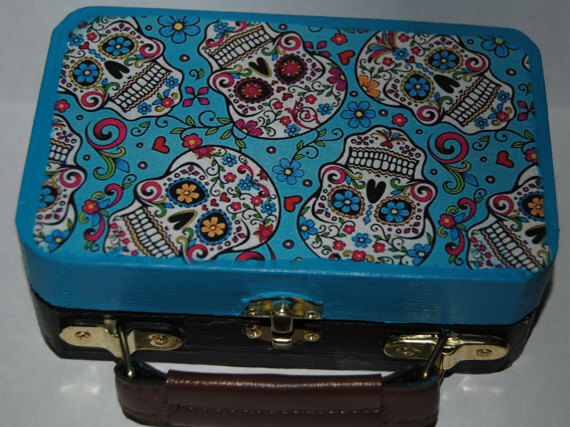 Hand painted inside and out, this would sit beautifully on a day of the dead alter filled with flowers or trinkets. 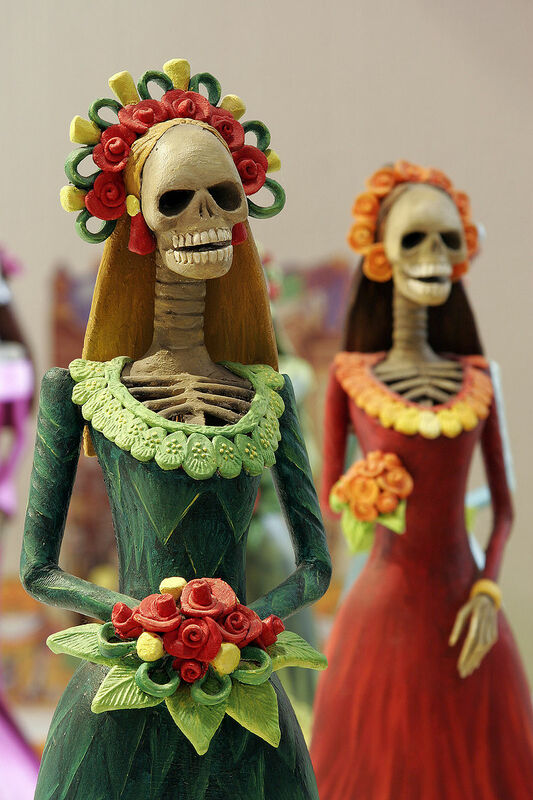 The bright color captures the spirit of both Halloween and The Day Of The Dead. I am a firm believer in the fun a decorated light switch cover can bring to a room. I like to think of them as “little canvases” It can be fun switching them to reflect the holidays as well. 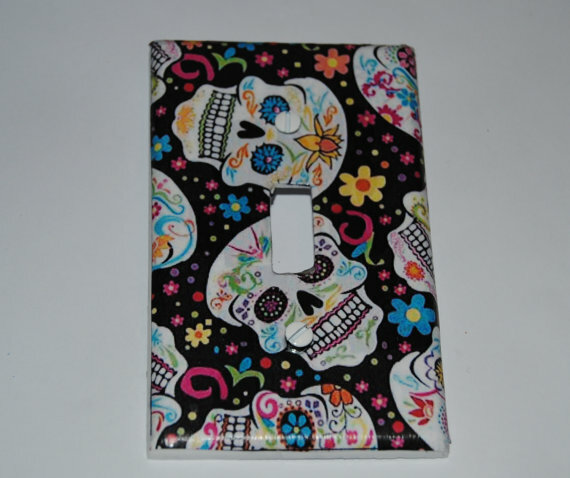 Decoupage light switch covers are both easy and fun to create. First ,you trace the cover with a pencil, including the area that the switch passes through. (You can use prints, scrapbook paper, napkins, old gift bags just to name a few) Using an X-Acto knife carefully follow the tracing. 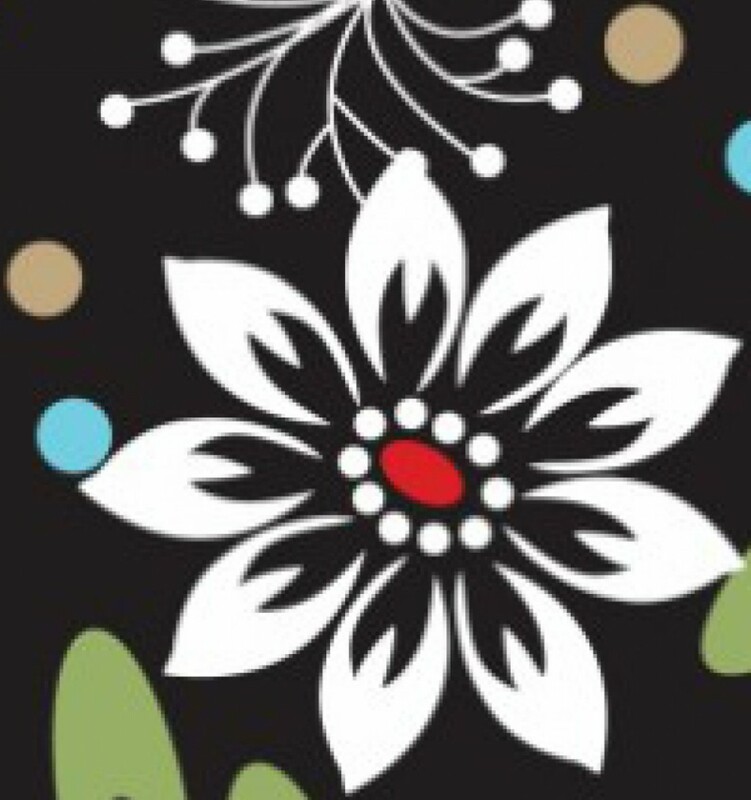 Apply Mod Podge to the plain light switch cover carefully smooth out the image you want to use. Apply multiple layers of mod Podge and allow to dry thoroughly between layers. Decorative, and full of color Sugar Skulls are full of life certainly Ironic considering it is a celebration of the dead. Stay Safe and Have a Happy Halloween!